Instead of paying upwards of $500 for a standing desk, it might be time to consider a more affordable, and eco-friendly version that costs just $65. The Cardboard Standing Desk from Chairigami doesn’t require any fasteners or glue to assemble, and can handle up to 300 pounds of equipment. It’s the perfect way to test the waters in a home office, growing business, or co-working space— without having to break the bank. 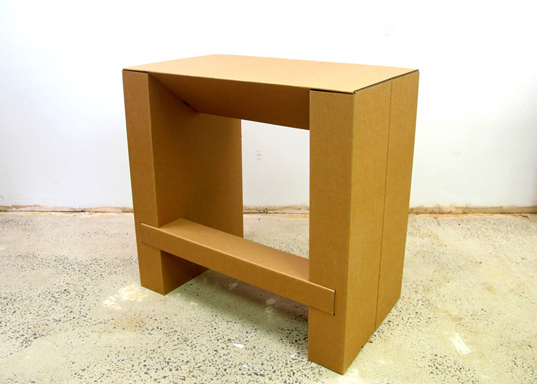 Designed by Zach Rotholz, who already has a lot of experience with cardboard furniture, the Standing Cardboard Desk is actually a rehash of one of his earlier creations. 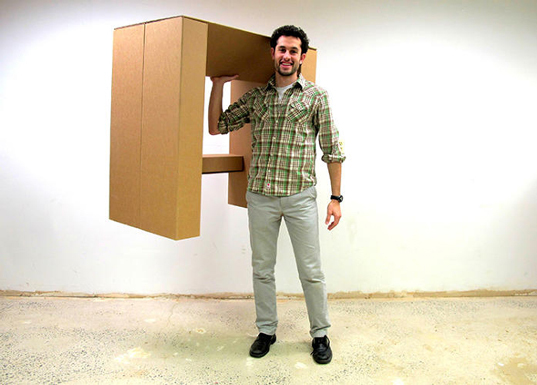 His first iteration used triple-wall cardboard, but to make the standing desk suitable for mass production, he had to adapt the design for a single-wall material. Rotholz has partnered with a manufacturer in Massachusetts, and they claim that the new desk can last up to four years with heavy use. As with his other furniture, the Cardboard Standing Desk is lightweight at just 15 pounds, which makes it easy to move should the need arise. That’s also the exact reason that Rotholz’s furniture has found its place at trade shows and other pop-up events that need furniture that is easy to transport to and from the event site. Best of all, should you decide the Cardboard Standing Desk isn’t for you, it’s much easier to recycle a few pieces of cardboard than an entire desk made from wood and metal. If you like the idea and want to help out, you can check out the Kickstarter Page for the desk right here. Instead of paying upwards of $500 for a standing desk, it might be time to consider a more affordable, and eco-friendly version that costs just $65. The Cardboard Standing Desk from Chairigami doesn't require any fasteners or glue to assemble, and can handle up to 300 pounds of equipment. It's the perfect way to test the waters in a home office, growing business, or co-working space— without having to break the bank.